On 25 October 1760, the British King George II died and his 22-year old grandson George William Frederick, previously Prince of Wales, became “His most Sacred Majesty George the IIId, King of Great Britain &c.” (above). Looking back from today’s vantage-point exactly 250 years later, George III’s long reign, starting on that October day in 1760 and extending sixty years to his death in 1820, has left many marks on our everyday life. The defining events of his reign include American independence; long wars against France under the Ancien Régime, the Revolution and the Empire; and the decline of the power of the monarch. At home, he presided over turbulent political divisions between the Whigs personified by Charles James Fox and the Tories under William Pitt the younger; acrimonious divisions in his own family, in which his regent and successor the Prince of Wales pursued policies antagonistic to the king; and the complete transformation of the country’s agriculture, sciences, industry and arts, exemplified by his founding of the Royal Academy of Arts in 1768. Policies which he declined to follow cast a long shadow: reform of the government of India, banning of the slave trade, and Catholic emancipation. 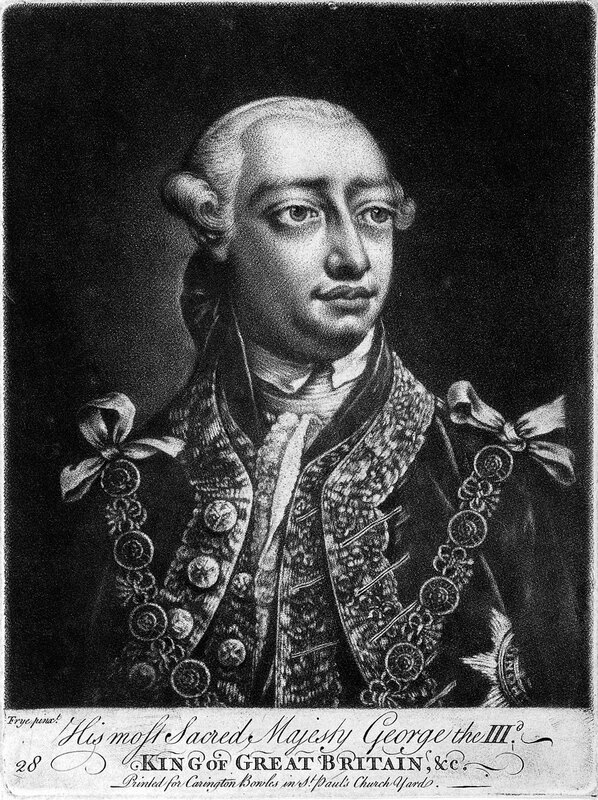 George III’s accession is therefore being celebrated in a number of institutions, whether “Half Term Madness” at York Castle Museum or special lectures in the Historic Royal Palaces. In London we are constantly reminded of him through Buckingham Palace, the house which he acquired as the monarch’s London residence, and through the magnificent King’s Library built in 1828 to house his books, which is now the Enlightenment Gallery of the British Museum. The books themselves are displayed in a spectacular glass tower in the entrance hall of the nearby British Library, and a marble bust of him sculpted in 1812 stands in front of the tower. In South Kensington his instruments of experimental philosophy are shown in a dedicated gallery on the third floor of the Science Museum. There are many representations of the king in the Wellcome Library. 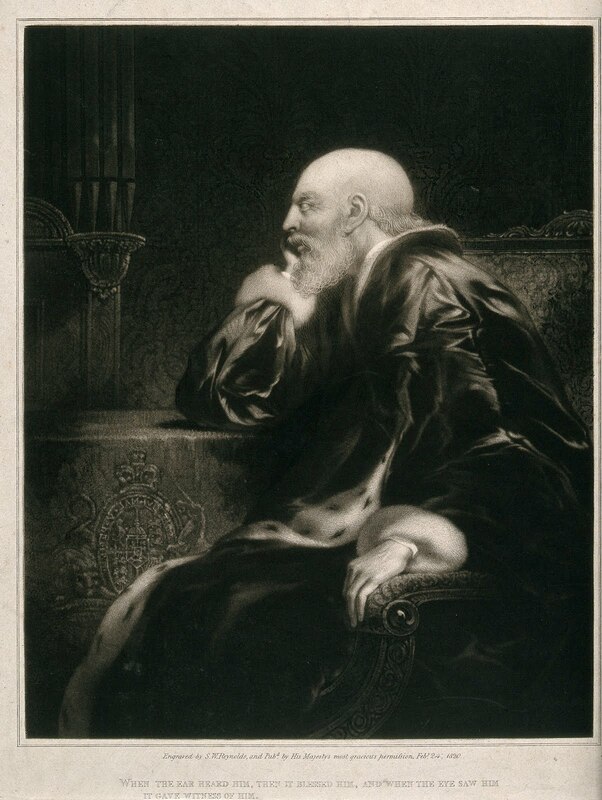 Among several intimate portraits which focus on the king as a person, the mezzotint from a portrait by Thomas Frye shown above (top: Wellcome Library no. 25552i) portrays him in 1762, two years after his accession: squared up for transfer, it would be suitable as a model for an inn-sign of the King’s Head. 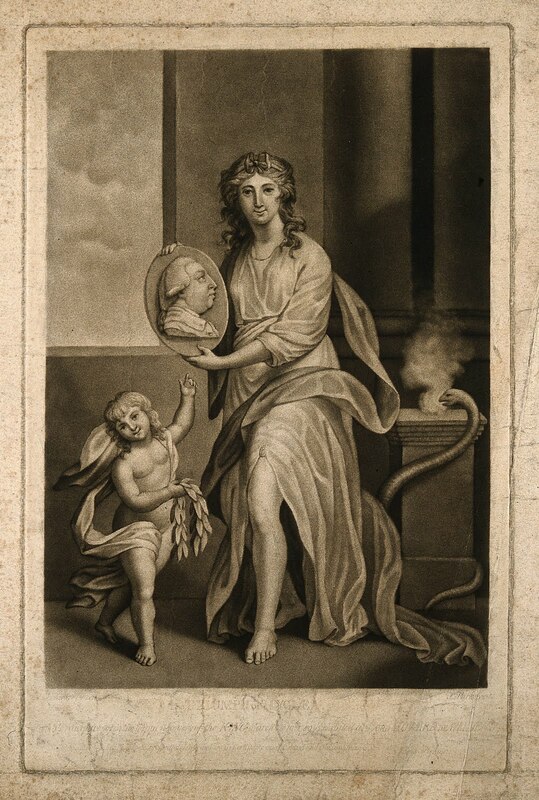 If we wish to test its accuracy against an independent control, we can compare it with this etching after a rapid sketch by Nathaniel Dance (1735-1811): the basic physiognomy is the same, though being drawn some thirty eventful years later, demonstrates the rejuvenation that tends to be involved in royal, but not only royal, portraiture. George’s big eyes were blue, by the way. Etching and stipple by Benjamin Smith after W. Beechey, 1 December 1804. For those requiring a less intimate and more formal representation, Sir William Beechey shows him in later years as a general in military uniform, with a groom taking away his Vandyckian horse. This print shows on the right an ornate vase which is missing from the original painting of 1799-1800 in the Royal Collection: the vase associates the king with the elegance denoted in the United Kingdom by the word “Georgian”. George’s scientific pursuits are shown in this affectionate caricature from 1803 showing him as a chemical analyst examining the composition of Bonaparte in an alembic. Bonaparte is described as the “Corsican earthworm”. 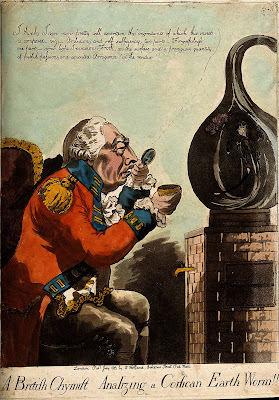 Either the artist did not know that worms cannot be chemically analysed in a single vessel or he was merely using “earthworm” as a term of contempt: the OED gives one of its meanings as “a disparaging designation for a human being, esp. a mean or grovelling person”. To read the king’s analysis, click on the image. 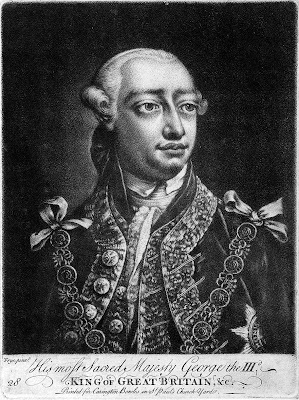 King George III suffered several extended periods of illness involving mental breakdown, the first being in 1765 when he described himself as “a mind ulcer’d by the treatment it meets with from all around”. Another lasted from the summer of 1788 to the spring of 1789. To celebrate his recovery in 1789 two prints shown here were published. A mezzzotint attributed to James Parker (left: Wellcome Library no. 27217i) shows “The triumph of Hygiea [Hygieia]. 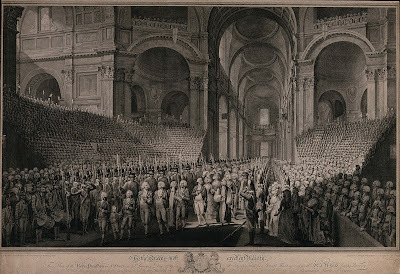 From a transparency of the happy recovery of the KING, March the 10th 1789, exhibited at Lord Howard de Walden’s”. In a transparency, extra elements are revealed when the work is lit from behind: when lit by Lord Howard de Walden’s lanterns, did the clouds disappear and a radiant sun take their place in the upper left part? 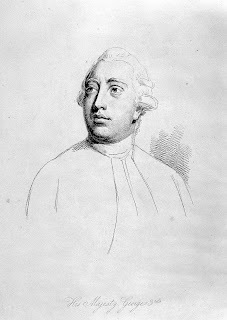 Line engraving by James Neagle after Edward Dayes, 1793. 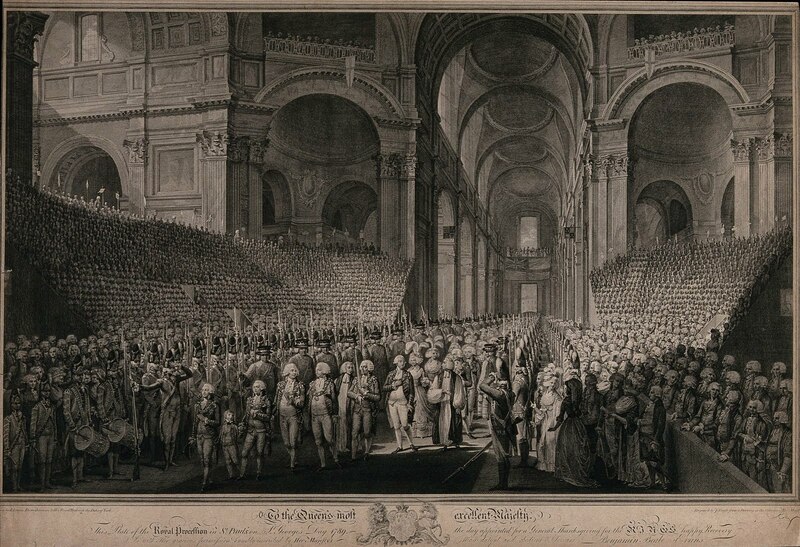 Another engraving (for detail click on image above) records a royal procession in St. Paul’s cathedral “on St. George’s Day 1789, the day appointed for a general Thanksgiving for the king’s happy recovery”, led by the king himself. The future seemed to be bright. 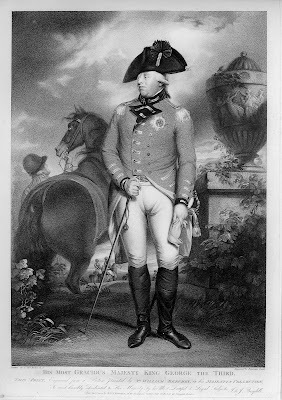 However, George III had plenty to agitate his mind during his career. The King of France was guillotined in 1793, and in the previous year Gustaf III, King of Sweden, had been assassinated by his political opponents. In this caricature by James Gillray, the King and Queen Charlotte are disturbed at their toilet when William Pitt rushes in to bring “news from Sweeden”: “Another monarch done over!”. The horrified King stammers: “What? Shot? What? What? What? Shot! Shot! Shot!”, showing the habit of repeating words in rapid succession which features memorably in Alan Bennett’s play as a sign of the King’s recovery of his personality. Further episodes of mental disturbance occurred in 1801 and 1804. 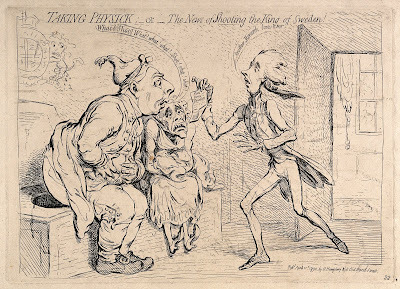 The king’s fiftieth anniversary was celebrated on 25 October 1810 with a reception at Windsor, but it seems to have precipitated the insanity which persisted until the end of his life. 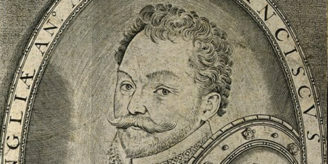 After this date the king was in confinement: the portraits were presumably either speculative or based on existing portraits. Two from this period show him as a King Lear-like figure, blind, bearded and lost to the world: one by Charles Turner, the other possibly by John Jackson: the latter (right) was published as a mezzotint immediately after his death on 29 January 1820. It was “published by His Majesty’s most gracious permission”: that must mean George IV. Coloured aquatint by J.C. Stadler after Charles Rosenberg, 1812. 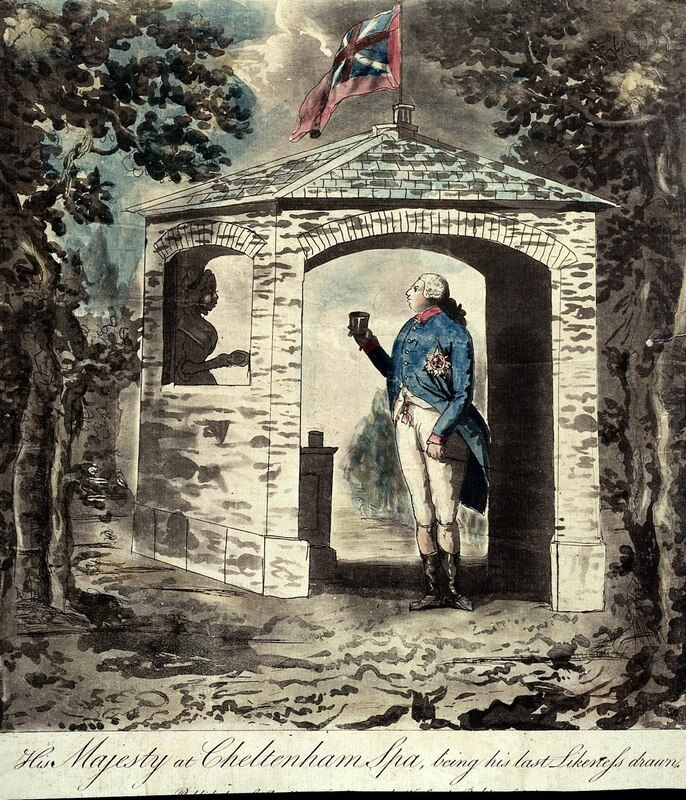 One of the last from-the-life portraits to be published must be this aquatint (above) by Charles Rosenberg, dated 1812 and showing the king standing in a pavilion at Cheltenham holding a glass of Cheltenham Spa water. It may have been drawn during an earlier visit to Cheltenham in 1788. In the shadow to left lurks the young woman who hands out the beakers of water. The Union flag flies on the pavilion roof. The king is alert and looks vigorous. 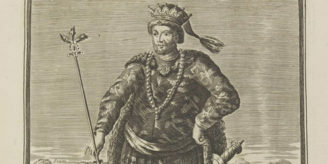 Alas, the Cheltenham water did not preserve his health, but from the nine portraits of the king shown above (selected from a much larger number in the Library), this happier portrait would be the writer’s choice for the Wellcome Library’s Item of the two hundred and fiftieth October since George III’s accession. What what what’s yours?